There is a Santa Maria Maggiore church in almost any city in Italy. 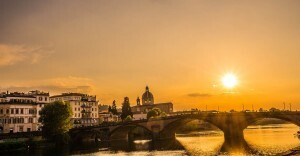 In Florence, it is one of the most ancient churches and a hidden attraction. Few steps away from the Duomo and Santa Maria Novella, this small church is not famous, not because it doesn’t contain important works of art (actually it does), but because it’s overwhelmed by all the other amazing attractions. Built in pietra forte, the typical stone of Florence, and with no decoration outside, it’s not even noticed by the mass of tourists walking directly from the train station to the Cathedral. Santa Maria Maggiore is an example of Romanesque architecture. We don’t know much about the foundation of the church. According to a legend, it was built by Pope Pelagius II in 580 a.D. The first mention in a document dates 931 a.D. 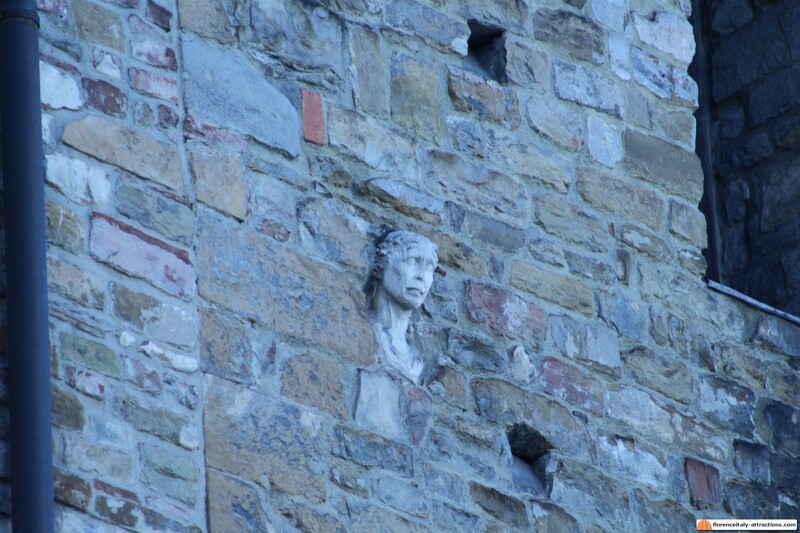 The church has a peculiarity: a marble sculpture (a head) is set in a lateral wall: not a decoration, because there is nothing else on that wall and also because the head, which is about human size, is so high in the wall that you won’t notice it, unless someone points you in the right direction. This head generated two Medieval legends. The most interesting legend is about a man condemned to death because of witchcraft. Once sentenced, the man was exposed to the public in a cart that led the man to the place of execution. Looks like a friar, observing the parade from a window of Santa Maria Maggiore, stopped the cart advising the soldiers that they shouldn’t give drink to the man. The friar believed that since the enchanter had a pact with the Devil, drinking could save him from death. At the friar screaming: “you won’t drink anymore”, the enchanter answered: “and you won’t take out your head from there anymore”. The friar was turned in stone, and he’s still there. 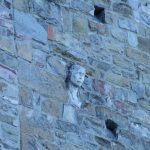 As you can imagine there is different versions of this legend: someone says it was a woman and not a friar (actually the marble head on Santa Maria Maggiore wall looks like a woman), someone else thinks it was not an enchanter but a witch. Someone even thinks the legend is referred to Cecco d’Ascoli, a famous scholar burned by the inquisition in Florence in 1327. Berta was a greengrocer in Florence Italy around the 13th century. Santa Maria Maggiore was her parish church and she was a devout Christian. She never married and dedicated all her long life to work, accumulating a substantial fortune, at least for a common woman. Berta decided to leave all her fortune to the church of Santa Maria Maggiore, subject to a constraint: the church had to use her money to cast a bell, that had to be rang at the sunset, to advise the farmers that the doors of the city would be closed soon. In the Middle Ages Florence, like any other city, was enclosed by a defensive wall. 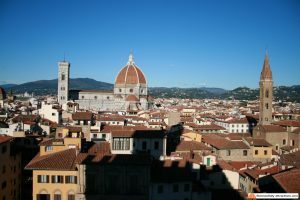 The doors of the city were closed at night, for security reasons, but also to collect taxes: citizens of Florence could enter for free, but foreigners had to pay. Anyway, for farmers growing fruits and vegetables, Berta’s suppliers, it was not infrequent to work for as long as possible and find themselves in trouble because the doors had been closed already. Spending the night outside was very dangerous. That’s why the people of the neighborhood placed on the church a marble head to thank Berta. The sculpture set on Santa Maria Maggiore wall looks like a late Roman sculpture. The Duomo area had been a Roman graveyard and there were many decorated tombs. Marble from these tombs was often reused in the Middle Ages to decorate new buildings like the Baptistery of San Giovanni. Probably the head came from one of these tombs.